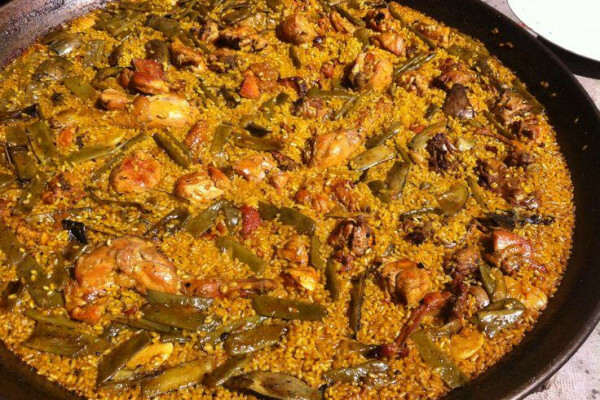 Cooking Paella is the most remarkable Valencian experience, not only at culinary level but also at a social level. Family and friends gather around a Paella while the cooking process, enjoying a good conversation until the moment to share table and dish with them. All-inclusive Price. Snack and full lunch/dinner. The lunch/dinner includes a White and red wine tasting, starters and the paella with salad, drinks, dessert and coffee/infusión. Also provided an apron and a chef’s hat. At the end you will receive a diploma certifying your new cooking skills and a little present to remember us for a long time. We are back at the Escuela, all placed around the fires with the paellas ready. In the first place, have you ever dressed up as a professional cook? For this, the School provides you with the necessary elements, for reasons of hygiene and safety, and these are: the apron, so as not to stain your clothes, and the chef’s cap. Then, the Paella teacher will be introduced, he will teach you step by step how to cook the authentic paella Valenciana and will explain the history of its creation and many other curious things. Do not worry about the language, the classes will be in both Spanish and English. The fun is guaranteed, whether you go alone, with a partner, or with children. During the preparation of the paella, always under the guidance of a Paella master, there are moments of active work, such as cooking the meat and vegetables, and calmer moments, such as the cooking of the broth, following the homemade procedure faithfully. Well, in these quiet moments, we offer a tasting of Valencian, white or red wine, or Valencian craft beer, accompanied by a tasting of the Valencian vegetable garden, the tomato, seasoned with the best virgin oils of appellation of origin of the Valencian Community, Delicious! This event has the purpose of cooking the Paella and making friends, you just have to bring the desire to have a good time, because learning and eating well, we guarantee it ourselves.